Matthew Hendry is a member of the Young Leaders Program at The Heritage Foundation. In recent weeks, tensions have been high across college campuses. Different activist groups have spoken out against perceived injustices facing their campus communities. As seen in the recent examples of the University of Missouri and Yale, student activism can quickly become threatening. 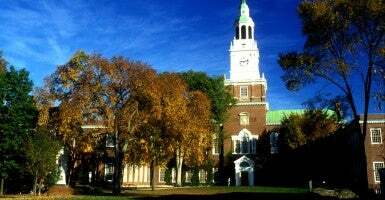 Dartmouth College was the latest school added to the growing list of protests on college campuses when a video surfaced on YouTube this month. The video depicts student protesters surrounding a study area in the library while chanting choruses of “Black Lives Matter.” The short video clip is bad enough—displaying intentional disruption to the learning environment. But a report from the student newspaper, the Dartmouth Review, demonstrates that what happened off camera is much worse. Students who refused to listen to or join their outbursts were shouted down. ’Stand the f*** up!’ ’You filthy racist white piece of s***!’ Men and women alike were pushed and shoved by the group. ’If we can’t have it, shut it down!’ they cried. Another woman was pinned to a wall by protesters who unleashed their insults, shouting ’filthy white b****!’ in her face. This is unacceptable. It is unacceptable to prevent students from studying by disrupting a campus library. That is on tape, and the offending students can and should be disciplined appropriately. It is worse (and possibly criminal) to intimidate and physically assault fellow students. If Dartmouth does nothing, it could be setting itself up for a major lawsuit if and when a student is actually injured by these protests. So what is Dartmouth’s response? Not good. She further commented: “There’s a whole conservative world out there that’s not being very nice,” implying that criticism of the assaults was politically motivated. There’s a whole conservative world out there that’s not being very nice,” implying that criticism of the assaults was politically motivated. Ameer has since apologized for “suggest[ing]” that “Americans with conservative political views … are not nice people.” And while the Dartmouth president has since announced an “investigation” into the library incident, Ameer has not apologized for supporting the protests. Her position is hardly unique: College administrations across the country have been quick to side with groups of protesters and the demands they seek. They have not been nearly so supportive of the educational environment for some students whom the protests seek to disrupt. While students do have a right to an education that they pay for, this does not give them the right to harm and disrupt the rights of their fellow students. If and when a protest goes too far, it is the job of college administrators to step in and explain what constitutes proper conduct. And if disruptions continue, the college might have to discipline students—not as a punishment (although some of them richly deserve it), but to protect the rights of other students to obtain an education.